Myth that Robotics is expensive! Interestingly there is one key factor lately that is contributing to the rise of robot numbers for industrial use. Low cost of production. If we see the graph given below, we can understand that with time, cost of robot components have been exponentially falling due to mass production while cost of manpower has been on the rise. Not until recently such trends have converged to a point where it makes commercial sense to implement robots to do repetitave work and complement a human worker in ways like never before. Technological advancements in machine learning and sensors have opened up new possiblities of applications which were previously not possible. The fact that Robots are expensive has slowly become a myth. One example is that of China, a manufacturing hub for the world has over 10 Million robots and the robotics industry there is growing at 30% year on year. It is generally perceived that China is a cost sensitive market where labor is cheap and hence low cost manufacturing is viable. 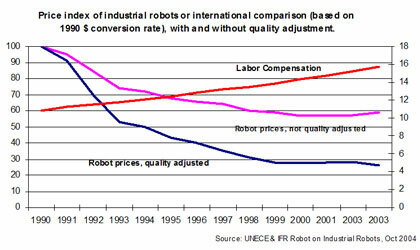 But the change in trend clearly shows the adoption of Robotics as a viable option. India is another cost sensitive market where the cost of labor is similar to china. However since India's manufacturing sector is only a fraction of that of China, the number of robots used are far less. India is a service oriented hub where skilled manpower is cheaper than the west and in the future it can become a destination for development of Robotics. Sectors such as automotive manufaturing and logistics are the biggest users of Robotics with Industry leaders such as ABB Robotics, KUKA Robotics and Fanuc Robotics all having setup base in India. However the newer industry segments such as Ecommerce, Logistics Parcels, Retail, etc have given birth to new opportunities for applications of Robotics. Few Indian companies including ArkRobot is trying to fill that space by developing new age Robots that can perform automatic storage and retreival tasks in the warehouse. The low cost of manpower at the warehouse does pose a challenge to build low cost robots, but India's low cost skilled workforce on the other side is enabling the Robots to be fully developed in India. Thereby rendering Robotics as a viable option for domestic companies to increase operational efficiency and cut costs while they gear up to compete with global competitors. As the trends continue to get better for Robotics, many applications will begin to become viable for the industry and an eco-system development of Robotics and components shall mean that India can soon become a global Hub for Industrial Robots. One factor however has single handedly attributed to less use of Robotics in the industry. That is "Lack of Awareness & Understanding". Industry experts say that close to 60% of Industries are not aware of Robotics as a viable option hence continue to operate inefficiently and hit stagnated growth for years. With Arkrobot’s introduction, we look to lead this changing trend and establish an ecosystem which can benefit the industry and our customers on a long run. China will be the worlds largest operator of Robots by 2017!